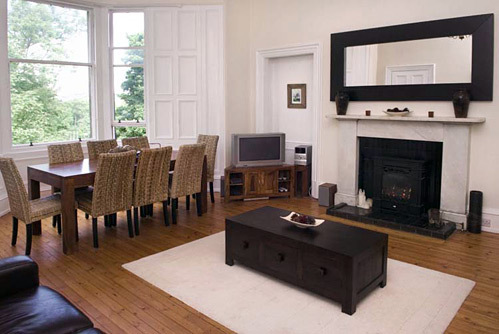 Our Edinburgh Castle View holiday flat is situated on Warrender Park Crescent and offers a fantastic base from which to explore Edinburgh's many attractions. The flat is available for short term holiday rental and sleeps up to 8 people. The apartment has been tastefully decorated and furnished and provides excellent accommodation for larger parties of up to 8 plus baby. There are 4 bedrooms, 2 large doubles and 2 twins, 2 modern shower rooms, a spacious kitchen with dining table for 6/8 and a large lounge with additional dining facilities for 8 allowing families or groups to dine in comfort whilst overlooking Edinburgh Castle - a wonderful sight at any time of day but particularly in the evening with the floodlit castle creating an even more dramatic backdrop. We hope we have catered for all our visitors needs with cd players in the lounge and kitchen areas, TV in the lounge with BT Vision, DVD player and telephone and Wireless Broadband for those that want to keep in touch. The kitchen has a dishwasher, washing machine, gas cooker, microwave, large fridge/freezer and ample pots and pans and crockery. There is also a high chair and travel cot plus baby crib. The apartment has full gas central heating with the addition of a lively coal effect fire in the lounge to create a cosier feel in the winter months. Please check availability or get in touch for enquiries and bookings.